Newcastle United owner and chairman Mike Ashley has been a source of frustration not just for the Toon Army's fans alike, but reportedly even the manager too. Benitez has appeared to have secured Premier League survival for yet another season. He is a huge fan favourite at St James' Park, and for many, the club's ambition has yet to have matched his. However, the signs appear to be that Benitez is about to sign on the dotted line for another two seasons at the club. Keeping Benitez would be a remarkable achievement for Newcastle United. It is understood that Benitez has insisted on large scale improvements of the club's training and youth facilities and these have been approved by the club's board. In addition, in the January transfer window, Benitez was able to secure the signing of Paraguayan midfielder Miguel Almiron for a fee of around £25 million. A big plus for Benitez, who appears to be winning his war with the boardroom to sign new, top players. Now, the club most demonstrate further ambition too. If the club are to improve on this season, they will need to invest heavily in the playing squad this summer. Ask an armchair fan if they are impressed with the Newcastle squad compared to a similar side, let's say West Ham, and most would say the Hammers are miles ahead of the Toon Army. Benitez is working wonders on a shoestring budget. Benitez, when speaking to the Chronicle this week, told reporters: “No it means we have been talking about it for a while. In the end, we have done it and hopefully, it will be for the good of the club. “We will have an idea how to improve things and we have waited too long to do it. But now it is a good sign. My future is not linked with that but it is still something positive." The signs look very good for Newcastle. 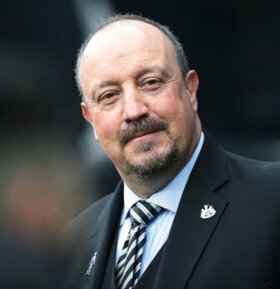 Benitez is a Premier League legend and the Toon Army can thank their lucky stars that the Spaniard is staying at St James for the foreseeable future.